After sending Suave Kajko of Canada HiFi off with a smile on his face and a D2v 3D in his arms, we knew he would enjoy his time with the industry-respected processor. However, we weren't quite prepared for the level of "enjoyment" he would experience. Earning a 5 star review, Editor's Choice award and even being named "the best A/V processor we ever tested", we are honored to call the D2v 3D our very own. "I listened to the 5.1 audience mix. This was without question the most engaging, musical performance I’ve heard in my home theatre to date... sounded breathtakingly real. The guitar strings played with the fullness and richness that I’m used to hearing when I play my own guitar. Every string picked, every chord strummed, played with a remarkable texture." The D2v processor’s transparent quality allowed every instrument to shine through with superb tonal accuracy, offering all the textural details. I enjoyed this disc many times before through various A/V receivers in my system but this was an almost entirely new experience. The Anthem D2v processor, along with the Axiom Audio ADA-1500 amplifier presented me with a heightened level of realism, which resulted in a hair-raising musical performance. I loved every part of it." "...this duo once again showed its true strengths and demonstrated the benefits of using separates in a multichannel system. I rarely ever listen to classical recordings in my home theatre simply because they don’t sound nearly as good here as they do through my two channel system. To my delight however this was the very first time that I was presented with a true high-end two channel performance in my home theatre." "All the best qualities of a great two channel system were offered here in spades: tonal accuracy, soundstaging, dynamics, detail extraction and overall engagement and musicality. Even when listening to the loudest of passages at high volumes, the soundstage kept its composure, along with its impressive depth and width. The overall presence and dynamics of the sound were superb. The macrodynamics – orchestral crescendos and bass drums – were presented with a great sense of impact and power. The microdynamics, such as small percussion instruments and triangles, were delivered with fine, realistic textures with proper decay. When classical music sounds this good, it leaves you – at least it left me – air conducting." "All of the tracks that I listened to from these albums played with a great balance, with instruments never over powering one another. Some of the digital harshness that I associate with these recordings on lesser quality systems was virtually entirely cleaned up by the D2v. The soundstaging was also more three dimensional here than I would ever expect from a home theatre component." "The bass response was remarkable, with each note articulated very well and with great tightness. I knew I had the D2v’s ARC system to thank for this. Not only does the ARC clean up the frequency response from all the speakers unlike other room calibration systems I’ve tested, it does a remarkable job at flattening out the bass response as well. The sonic benefits of the ARC are just awesome." "The Anthem/Axiom duo did a remarkable job when tasked with sorting out all of the individual components of this challenging passage. Each of the sonic components was clearly defined within its own space, yet combined seamlessly into an exhilarating audio experience that carried the movie forward. Yet amidst all the action, the character voices were presented with the outmost clarity. The D2v demonstrated an uncanny ability to transport me sonically right into every scene." "The audio was hyper realistic and so transparent that I felt emotionally connected to the characters during the quieter chapters. On the opposite side of the spectrum, the battle sequences felt frighteningly real with bullets zooming between the channels and explosives blowing up all around me. The presentation offered bountiful power and fantastic dynamics." "The Anthem D2v is a highly advanced machine that brought me pleasure unlike any other A/V processor in my home theatre. Two-channel music, multi-channel Blu-ray concert discs and movies have never sounded better. Every time I sat down to enjoy music or watch a film, I was rewarded with a remarkable sound performance. Thanks to its top-notch video processing lower resolution and interlaced video sources also looked fantastic. If you desire nothing but the very best for your home theatre, I can’t think of a better component to place at the heart of your system. 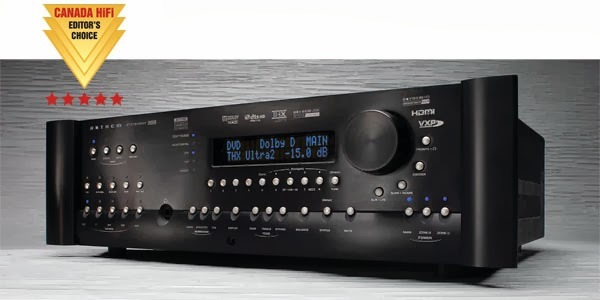 The Anthem D2v A/V processor is a winner in every regard and hence deserves our highest level of praise. 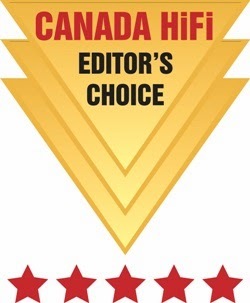 For being the best A/V processor we ever tested, we proudly award it the “Editor’s Choice” recognition." Click here! 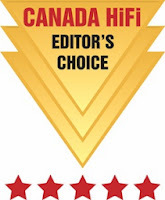 to read the entire review from Canada HiFi. Click here! for more info. on the Anthem D2v 3D.